In just another epic example of the failure of parties endorsing in primaries, and boards of elections serving more as boards of (s)election in Ohio- Republican party favorite Bill DeFries will appear on the ballot on May 8 despite dropping out Mar 1. It was a crowded race to begin with – former Dayton Mayor Gary Leitzell had thrown his hat in the ring after barely losing to Debbie Lieberman the last race. Former Miami Township Trustee Bob Matthews is running again, after losing to Judy Dodge last time. Newcomer DeFries had zero political experience yet was the party pick. Miami Township trustee Doug Barry is spending money like a house on fire to win the primary- always showing up on campaign materials with his much better half on all his campaign materials. She, btw is a democrat. The winner of the primary will go on to face either Carolyn Rice or Walter Hickman Don Shaffer (thanks to Gary Leitzell for catching my mistake). Full disclosure, I’ve done work for Leitzell and Matthews, through my company The Next Wave. 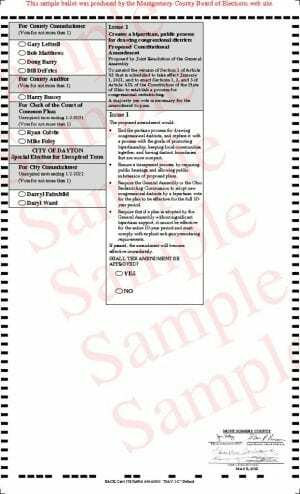 How DeFries name is still on the electronic or printed ballots 38 days after a withdrawal is a serious question. With print on demand solutions- there is no huge window for absentee ballot printing, and the county uses touchscreens for in person voting. Considering the expense the BOE is willing to go to for special elections for a single candidate- usually caused by their selection processes, there is no excuse. Including DeFries name can only hurt the other newcomer to county races- Barry, which is no big loss. In my limited experience of meeting him, he’s not worthy of being elected dog catcher. His wife on the other hand is a sharp business person, running a private college turning out kids that are 100X more qualified to work than Sinclair in my field. Correction. The winner will go on to face Carolyn Rice or Don Shaffer. Walter Hickman is running for state representative against Fred Strahorn. Still smh at this screw up ….. Thanks. That’s what I get for posting during work. Corrected. I still don’t understand this screw up either. We don’t pre-print ballots in March.